Welcome to the Badlands National Park Information Guide. The closest major airport is 80 miles northwest of the park at Rapid City, South Dakota. 1. Take I-90 to Wall, South Dakota. Take the exit at Wall (exit 110) to state road 240 South to Badlands National Park. 2. Take I-90 and just between Wall and Kadoka, South Dakota there is a small town of Cactus Flat (exit 131), take this exit onto state road 240 South to Badlands National Park. Take I-90 and just between Wall and Kadoka, South Dakota there is a small town of Cactus Flat (exit 131), take this exit onto state road 240 South to Badlands National Park. Head towards Highway 20 East or West and then to Highway 83 North to I-90. Then follow number 1 or 2 in the “From the North” section to Badlands National Park. Take I-90 East to the exit at Wall, South Dakota (exit 110) then follow state road 240 South to Badlands National Park. Authorized as Badlands National Monument on March 4, 1929, President Franklin Roosevelt issued a proclamation on January 25, 1939 that established Badlands National Monument. In the late 60’s, Congress passed legislation adding more than 130,000 acres of Oglala Sioux tribal land, used since World War II as a U.S. Air Force bombing and gunnery range, to the Badlands to be managed by the National Pakr Service. An agreement between the Oglala Sioux Tribe and the National Park Service governing the management of these lands was signed in 1976. The new Stronghold and Palmer Creek units added lands having significant scenic, scientific and cultural resources. Congress again focused it’s attention on the Badlands in 1978 on 10 November, it was redesignated as Badlands National Park. The park consists of nearly 244,000 acres of sharply eroded buttes, pinnacles and spires blended with the largest, protected mixed grass prairie in the United States. Sixty-four thousand acres are designated official wilderness, and is the site of the reintroduction of the black-footed ferret, the most endangered land mammal in North America. The Stronghold Unit is co-managed with the Oglala Sioux Tribe and includes the sites of 1890’s Ghost Dances. The majority of park visitors come June through September, lowest visitation is in November through March. Over 11,000 years of human history pales to the eons old paleontological resources. Badlands National Park contains the world’s richest Oligocene epoch fossil beds, dating 23 to 35 million years old. The evolution of mammal species such as the horse, sheep, rhinoceros and pig can be studied in the Badlands formations. “The prairie is not forgiving. Anything that is shallows–the east optimism of the homesteader… the trees whose roots don’t reach ground water–will dry up and blow away,” wrote Kathleen Norris in Dakota. Badlands prairie contains about 56 species of grass, which are the anchor species for a complex community of plants and animals. The prairie once sprawled across one-third of North America. Today, the patchwork remnants of native grasslands represents adaptations to millions of years of changing conditions and sustain a diverse citizenry. All facilities and exhibits at both visitors centers are wheelchair accessible. Of special note, in Ben Reifel Visitor Center, a “Touch Room” is located where fossils, rocks, bones and plants may be handled. Other wheelchair accessible facilities include the Fossil Exhibit Trail, Window Trail, restrooms and three designated handicapped campsites in the Agate Loop of Cedar Pass Campground, and one designated group campsite. The Cedar Pass Lodge dining room and gift shop are also wheelchair accessible. The park orientation film at both visitor centers is captioned for the hearing impaired. 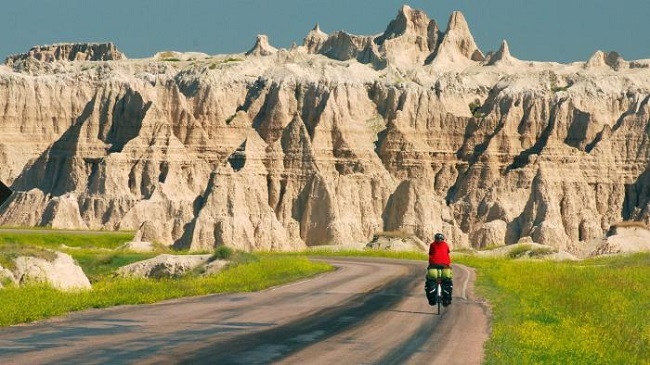 Stay for a minimum of six hours to tour Badlands National Park. It would require at least two days to visit to all sites and areas in the park. Inquire at the visitor center for suggested bicycling opportunities using existing roads. Because of danger of wildfires, open campfires are NOT allowed in the park. Charcoal can be used in an appropriate container in campgrounds and picnic areas. There are two campgrounds in Badlands National Park, Cedar Pass and Sage Creek Primitive Campgrounds. Both these campgrounds are open year round. Cedar Pass is first come first serve, but will take reservations for group camping. Saga Creek is a primitive camping area and is first come first serve. Call or write for backcountry camping information. Climbing is permitted in Badlands National Park. Climbing buttes and rock formations is allowed but can be dangerous due to loose, crumbly rock. Be careful! In the park, Cedar Pass Lodge also has a restaurant that is open mid-Apr to mid-Oct. In the Badlands Visitor Center, you may buy film, maps, as well as other informational materials. You can always bring your own food or there are restaurants in the local communities listed above. Horseback riding is allowed anywhere in the park except on marked trails, roads or in developed areas. An area in Sage Creek Campground has been designated for horses. Inquire at the visitor center for more information on horse use at Badlands. In Badlands National Park, there are two Campgrounds, the only other lodging in the park is Cedar Pass Lodge. The Lodge offers 23 rustic cabins for rent during their normal spring to fall season of mid-Apr to mid-Oct. Cedar Pass Lodge also has a restaurant that is open during the same time frame. The only other park fee is for camping. Dogs and other pets are allowed only in developed areas such as campgrounds, parking areas and along roads and must be kept on a leash no longer than 6 feet in length at all times. They are not allowed in public buildings, or on any hiking trails. This policy has been instituted to provide a greater degree of protection to park resources. Bigfoot and Conata Picnic Areas have tables, trash cans and pit toilets. No camping, campfires or water. Ranger / Naturalist programs include scheduled talks, walks and evening campfire programs by rangers. These programs are scheduled mid-June through Labor Day. Check the bulletin boards and the park newspaper for schedule. Located: Cedar Pass, just inside the park entrance. Should you drink the water? Water in Badlands is too full of silt for humans to drink, and will quickly clog a water filter. When hiking, always carry water with you. Drinking water is available only at the Cedar Pass area, the White River Visitor Center and the Pinnacles Ranger Station. Badlands weather is unpredictable. Heavy rain, hail and high, often damaging winds are possible. Lighting strikes are common. During a severe electric storm, stay away from ridges, exposed places or isolated trees. Summer temperatures often exceed 100 F. Sunscreen, a hat and water are essential to avoid severe sunburn, dehydration and heat stroke. Winter travelers should be alert for approaching storms that can bring sleet, ice, heavy snow and blizzard conditions.